The Tenth Doctor, Gabby, and Cindy have their work cut out for them when they encounter a lost spaceship…whose crew is being absorbed by mysterious, ghostly creatures! But everything is not as it seems, especially when disturbing facts about the crew come to light! The Eleventh Doctor and Alice visit 19th Century San Francisco, but there’s just one problem – it’s full of robots! Do the automata come in peace, or does their displacement in time signal something sinister? The Twelfth Doctor and Bill find London’s Piccadilly Circus transformed into an empty wasteland…of pteradactyls! 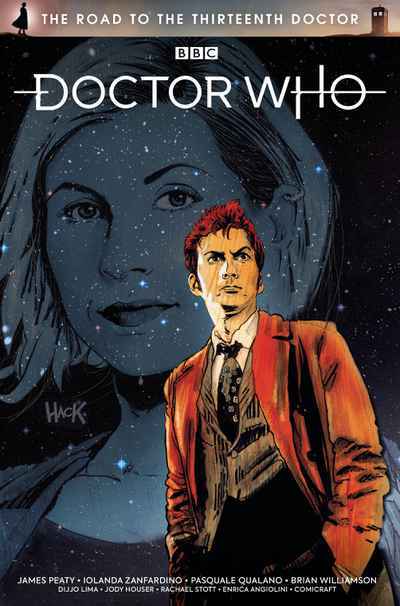 And on the Road to the Thirteenth Doctor, written and drawn by the creative team of the all-new ongoing Thirteenth Doctor series, meet a brand new character who has been drawn to incarnations of the Doctor all throughout history – but will they be friend or foe? !